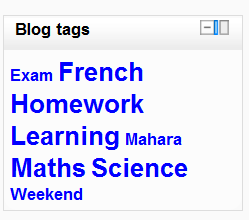 A Blog Tags block displays a list of blogs where font size visually indicates each blog’s use. The more frequently used blogs appear in a larger font size and least used in smaller fonts. This format is sometimes called a “tag cloud”. Click the “Turn editing on” button. Blog tags block title – You can change the title of the block. Number of tags display – Here you specify how many tags you want to display in the block. Display tags used within this many days – You can specify here how recent the tags that you want to appear are. For example, if it is 90 days then only tags that have been used in the last 90 days will be used. Sort the tag display by – Here you can specify in what order you want the tags to appear. You can choose to sort the tag according to tag name. So the tags will be sorted in alphabetical order. Or you can choose to sort them according to last date used. So the most recent tag would appear first.